On a typical morning, the Golden Gate Bridge is practically invisible. Heavy fog blankets the world-famous landmark as locals and tourists, clad in layers of warm clothing, walk about Fisherman”s Wharf, just a few miles away. 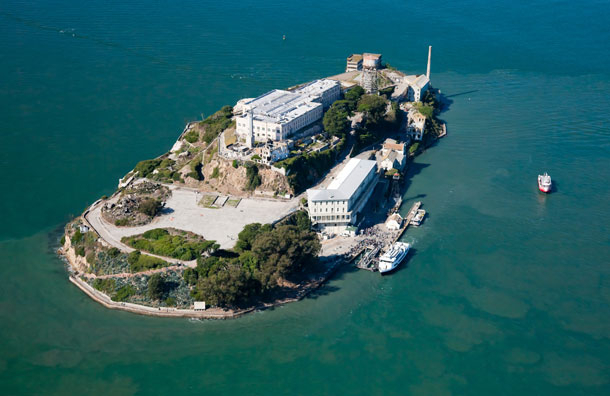 Many embark on a boat ride to Alcatraz; some enjoy soup, served in warm sourdough bread. Somewhere across the city, several families await the Powell-Hyde cable car, while others walk up the hill to Alamo Square, home of the postcard-perfect Painted Ladies. Another family searches for the “Full House,” and another peddles their way to one of the city”s outlying and ever so charming towns. Welcome to a weekend in San Francisco with kids. Get an early start (by 8:30 a.m.) on your San Francisco weekend trip with family to avoid a long wait for the California Street Cable Car, which will take you to Ferry Plaza Market Place, a large ferry terminal with shops and restaurants. On Tuesdays, Thursdays and Saturdays, you can visit the Ferry Plaza Farmers Market for fresh fruit, vegetables, bread, cheese and more. You"ll also find an array of jams and other spreads to enjoy during a weekend in San Francisco -- these make great souvenirs to enjoy back home. If you have some extra time and teenagers in the family, check out Union Square, San Francisco"s shopping district. Take a bus to Pier 33 in the midst of your weekend getaway in San Francisco (parking is limited and expensive), where you"ll board a boat to Alcatraz. Guided tours take you through the creepy penitentiary that once housed America"s most notorious criminals, including Al Capone and Robert Stroud. Afternoon tours last about two and a half hours. Book your tickets in advance (several weeks or even months before the trip) -- they will sell out. After you return to Pier 33, make your way to Pier 39, otherwise known as Fisherman"s Wharf. There are plenty of places to enjoy dinner, but we like Neptune"s Waterfront Grill & Bar best -- you can watch boats sail in and out of the harbor as you eat American fare. You might even get to watch sea lions interact, too. Afterward, catch a show in the center of the pier -- local bands and magicians perform nightly. 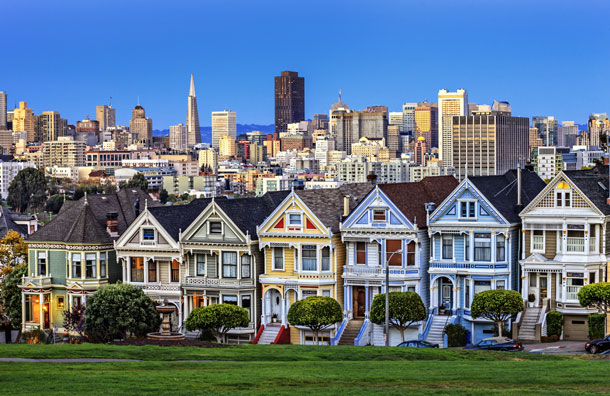 Grab some bagels and hop on a bus toward Alamo Square Park during your weekend trip to San Francisco -- this is a pretty place to enjoy breakfast. It"s also where you"ll find the Painted Ladies, the colorful collection of houses that come to mind when anyone thinks of San Francisco; they"re also featured on just about every city postcard. We admit they"re not as exciting in real life, but are still worth a visit. Afterward, walk to 1709 Broderick Street to see where â€œFull Houseâ€ took place. The show wasn"t filmed here, but the home was featured in its opening credits. The home is blocked off by a gate, so you can"t walk up to the door or sit on the steps, but you can still get a photo from the sidewalk. San Francisco is home to several world-famous landmarks, but did you know it"s also home to the Walt Disney Family Museum? You won"t find rides and games at this unique institution; instead, you"ll learn about Walt Disney -- both the man and the company -- through storyboards, early drawings of Mickey Mouse and a 14-foot model of Disneyland. Special exhibitions, often centered around the classic films, are featured throughout the year. San Francisco"s charming neighborhoods meet at Golden Gate Park, the perfect place to wind down after a busy day. Walk to the west end of the park in the middle of your weekend getaway to San Francisco, where you"ll see Buffalo Paddock Bison on a hillside! Don"t miss the Koret Children"s Quarter either -- this is where you"ll find a historic carousel, along with several playgrounds. Afterward, make your way toward Golden Gate Bridge for a family photo. Rent bicycles from any of the local vendors (Bike and Roll and Blazing Saddles are reputable) and ride to the scenic town of Sausalito. Here, you"ll find plenty of restaurants to enjoy lunch. Other highlights include Rodeo Beach and the Marine Mammal Center. Note: If you have small children, they should ride on the back of your bike â€“ it"s about a seven-mile ride, and you"ll cross the Golden Gate Bridge. Feel free to stop at any point during the trip, except when crossing the bridge -- it gets crowded with other tourists and professional cyclists. Dress warm, too -- San Francisco is generally cool, but it feels even colder on the bridge because of strong winds. After your day in Sausalito, take the ferry, along with your bike, back to Fisherman"s Wharf. Tokens for front-of-the-line access are available on a first-come, first-serve basis, and we recommend you purchase them to avoid long wait times for the ferry. 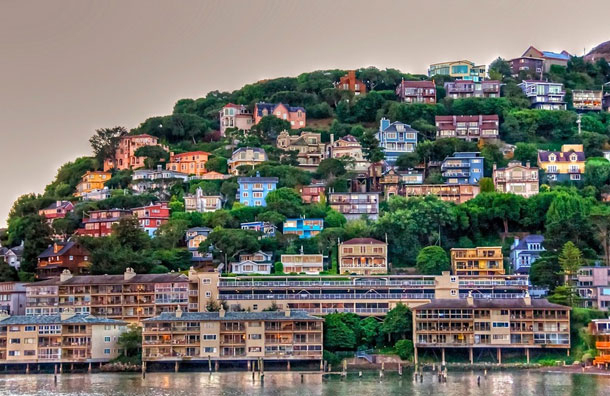 You should get the tokens, as well as your ferry tickets, as soon as you arrive in Sausalito. The views alone are worth a stay on your San Francisco weekend trip with family, but when you add the children"s menus, child safety amenities, Nanny Survival Kit, Holiday Teddy Bear Tea and welcome amenities for children, you get the ultimate family-friendly hotel. You"ll also appreciate the hotel's spacious rooms and suites, onsite dining options (both casual and upscale) and state-of-the-art spa. 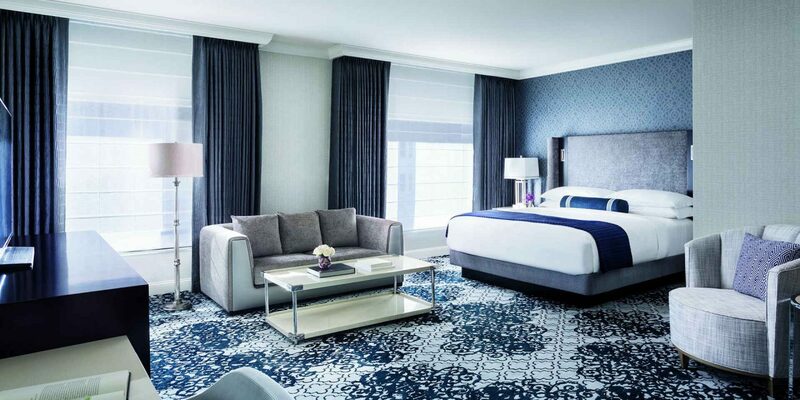 Located near Nob Hill, The Ritz-Carlton San Francisco is within walking to distance to several parks, and is a 10-minute ferry ride from Alcatraz. The Argonaut Hotel offers convenience with a location in Fisherman"s Wharf and plenty of extra perks. 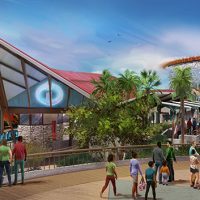 These include free Wi-Fi, a daily, complimentary happy hour and a fitness center. Unique to the hotel are its six â€œTall Rooms,â€ with longer beds and taller showerheads. In-room spa services and pet-friendly accommodations are also available. When you"re hungry, order room service or visit Blue Mermaid Chowder House & Bar, located onsite. 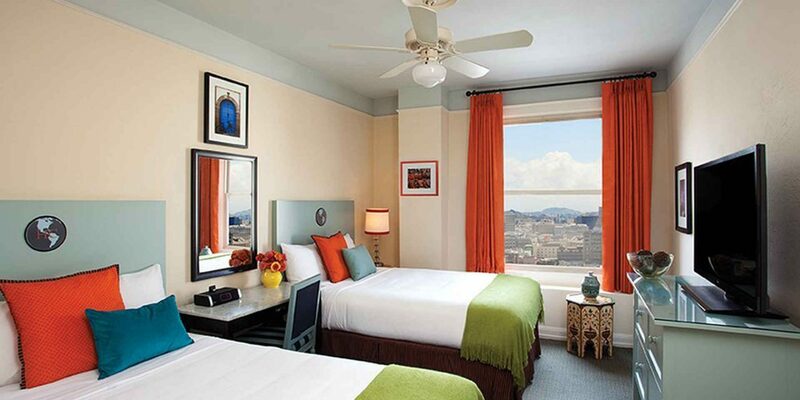 Located in Nob Hill, Hotel Carlton offers funky, eclectic accommodations at low rates -- perfect for a weekend trip to San Francisco with family. The hotel consistently offers discounts, and more than often, you can find a room for under $100 per night. Family-friendly amenities include free Wi-Fi, laundry services and filtered water machines throughout the building. There"s also a complimentary wine hour held each evening. Guestrooms, which are pet-friendly, feature flat-screen TV"s and Serta mattresses; some units provide city views. At this hip restaurant in Mission District, you"ll enjoy Californian- and Mediterranean-inspired food while independent and foreign films play on a courtyard screen. Cozy indoor seating and a children"s menu are also available. If you"re looking for the best place to dine with a view on your weekend getaway to San Francisco with family, this is it. 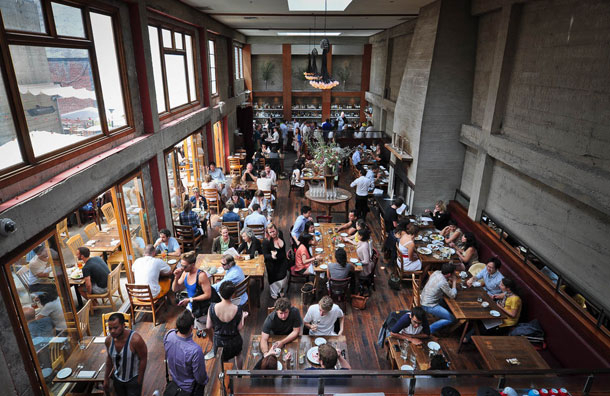 Located in Embarcadero, Waterbar offers exquisite vistas of the San Francisco skyline. 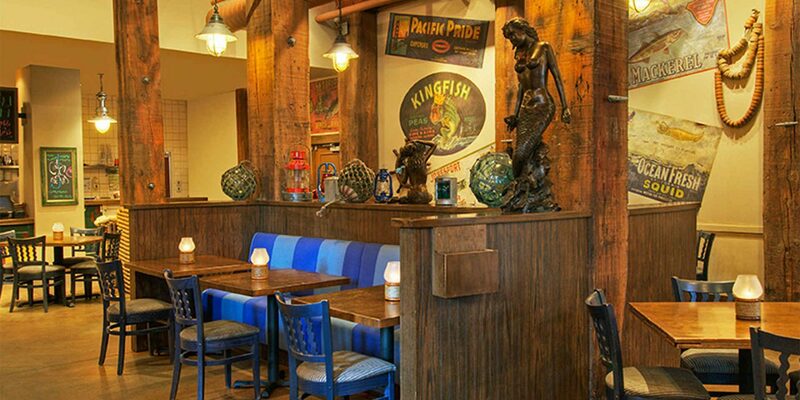 Plus, it has floor-to-ceiling aquariums with colorful fish, so the kids will be occupied while you wait to eat. Waterbar offers a separate kid"s menu and welcomes pets, too. If you hadn"t already considered it, let us remind you that Ghirardelli Chocolate Shop is not only a delicious delight, but also a historic landmark. The company dates back to 1852, when it was founded by Domingo Ghirardelli. The flagship location in Ghirardelli Square features every kind of chocolate you can imagine, along with ice cream galore. 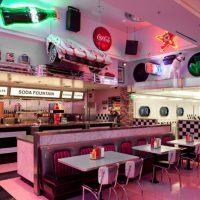 Just steps from Golden Gate Park, this restaurant offers a casual atmosphere for breakfast, lunch and dinner, which mostly consists of American fare. Brunch is also served on Saturdays and Sundays. A Kids Bar menu features non-alcoholic fruit cocktails, and the kid"s menu offers the usual selection of chicken fingers, macaroni and cheese and the like. Sourdough bread is a staple in San Francisco, and Boudin is a prime spot to enjoy it. It"s especially best in bread-bowl form, with one of the restaurant"s delicious soups inside. Boudin also serves pastries, sandwiches, salads and pizzas. 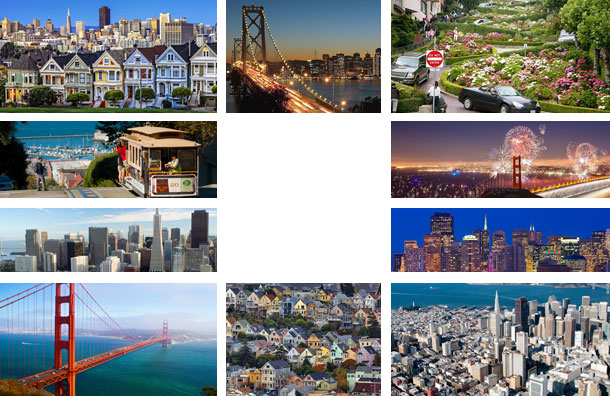 There are several locations throughout California, but San Francisco is where it all began. The cafÃ© is located in Fisherman"s Wharf. San Francisco hosts several events monthly, and some of the most popular happenings revolve around athletics. Take, for instance, the San Francisco Marathon (June), The Giant Race (August), Emerald Across the Bay 12K Race and ESCAPE from Alcatraz Triathlon (March), perhaps the most popular one. Easier competitions, such as 5K walks and runs, can also be found on any given weekend. 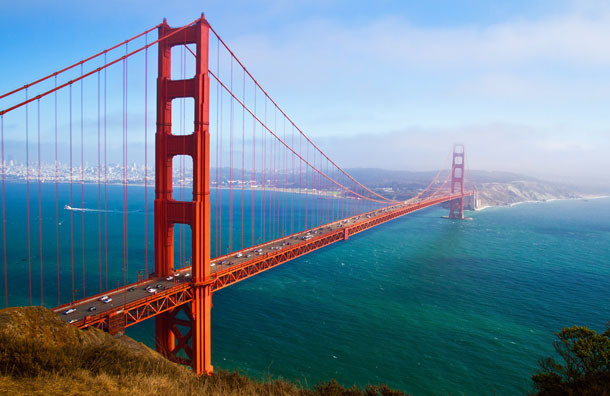 Consider participating in one of these exciting events on your weekend getaway in San Francisco with family! 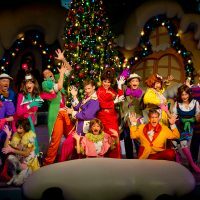 In particular, Ghirardelli Square is a hub for family-friendly events, with a Chocolate Festival in September, KidsBash (street festival just for kids) in June and Light the Menorah and Tree Lighting Ceremonies in November. Other holiday events include the Union Street Fantasy of Lights, Parol Lantern Festival and Parade and The Great Dickens Christmas Fair. Throughout the remainder of the year, plenty of festivals highlight music (from local to international), automobiles, animals, flowers, food and films. San Francisco gets crowded with tourists and traffic, so leave your car at the hotel if you"re able. Parking meters are available for those who prefer to drive, and most of them operate from 9 a.m. to 6 p.m. Monday through Saturday, with exceptions on Sunday. The rates are not cheap -- you"ll pay between $2 and $3 per hour. Public parking facilities are also available, but are even more expensive. The city"s cable cars navigate three routes: Powell-Hyde, Powell-Mason and California Street. Fare is $6 per person. Unless you can get there before 8:30 a.m., avoid the stop at Powell and Market Streets â€“ it"s a major tourist trap. 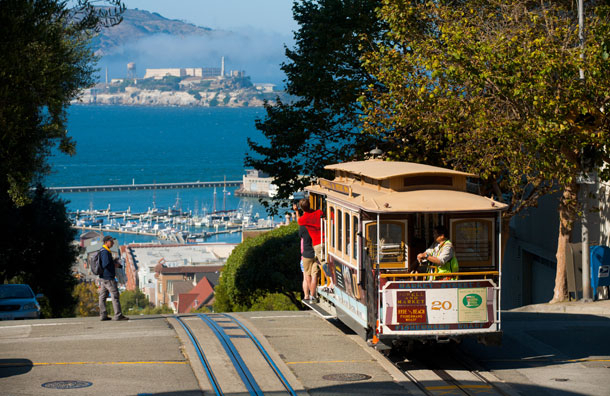 In addition to cable cars, San Francisco Municipal Transportation Agency operates buses and trains. Adult fare is $2.00, and children age 5 to 17 cost $0.75. Kids under age 4 ride free. Day passes are available. Be aware that on the most popular routes, particularly those that travel to Pier 39 (Fisherman"s Wharf), the buses and trains get very crowded.